Released in 1966 as part of a double bill with fellow American International Pictures B-movie Blood Bath, Queen of Blood was assembled by director Curtis Harrington with footage from the Russian films, Mechte Navstrechu and Nebo Zovyot. It certainly has a distinctive look and atmosphere that suits its blend of horror and science fiction. The opening credits play over a series of unsettling psychedelic paintings of what appears to be an alien landscape while appropriately creepy atmospheric music by Leonard Morand sets just the right mood of dread. Queen of Blood is set in 1990 where traveling to the Moon is no problem, space stations exist there, and the powers that be are looking into exploring Venus and Mars for signs of intelligent life. Cue cool looking shots of matte paintings depicting life on these planets and footage of an alien race in shadows, which gives an ominous teaser of what’s to come. We soon meet our hero, Allan Brenner (Saxon) as he has lunch with his girlfriend Laura James (Meredith) and two fellow astronauts, Paul Grant (Hopper) and Tony Barrata (Eitner). This gives the filmmakers a chance for some wonderfully cheesy banter but you can tell that Dennis Hopper and John Saxon aren’t taking it all that seriously. Their lunch is interrupted by an announcement by Dr. Farraday (a slumming Rathbone). He informs our heroes that they’ve finally received communication from an alien race that plans to send an ambassador to Earth. The ambassador’s craft crashes on Mars and sends an SOS to Earth. So, Farraday sends Paul and Laura to check it out. When Paul and his crew run into trouble and find a dead alien on Mars, Alan and Tony fly there to help in the search for another alien craft. They find it and inside the sole survivor – a green-skinned female alien (Marly). While the first two thirds of Queen of Blood is all set-up, in the last third all hell breaks loose when alien queen wakes up. It’s wild to see Dennis Hopper play such a straight-laced role, especially during this period in his career when he had been blacklisted in Hollywood and was relegated to doing American International Pictures (AIP) films for Roger Corman. Just two years later, he would direct, co-write and star in Easy Rider (1969). John Saxon, god bless him, does his best to play the square-jawed hero of the film without a hint of irony. Florence Marly has such an expressive face, which is good because as the alien queen she has no dialogue and uses her creepy smile to captivate the male astronauts. In a nice touch, she also sports a fantastic beehive hairdo that also resembles an onion! The 1960’s representation of alien beings looks great and oddly more “alien” than a lot of contemporary alien invasion films. It may be due to the fact that the style of that decade looks so foreign to us now. There is a simplicity to their look that is refreshing and the unsettling music really helps sell the otherworldly nature of these beings. 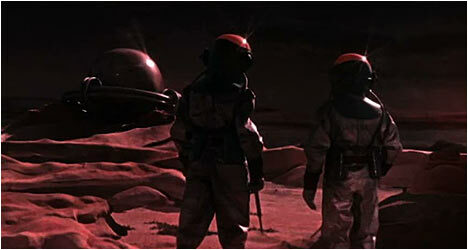 The interior of the alien spacecraft evokes the style of Mario Bava’s Planet of the Vampires, released a year earlier in 1965. I love the wonderfully clunky-looking astronaut gear – their helmets are huge and don’t move at all, restricting movement in an awkward way. There’s something great about knowing that all the special effects in Queen of Blood were done by hand. It gives everything an authentic quality. It doesn’t have the unreal artificiality of a lot of CGI – no matter how good it looks you know that what you’re seeing doesn’t exist. The hand-made sets and special effects have a clunky charm all their own and this is one of the pleasures of this film.